SEAL BEACH, CA -- (MARKET WIRE) -- December 6, 2006 -- Looking for a great Holiday gift for under $50 for the outdoor enthusiast in your life? The lightweight, portable Add-A-Cabana™ is a unique gift that will keep on giving all year round. The vinyl "cabana" fits snuggly on the back end of SUVs to give owners a flexible extension to the back end of the vehicles for recreational uses. Ed Martin, President of Add-A-Cabana, says, "The Add-A-Cabana™ makes a perfect gift for someone that enjoys outdoor activities, yet needs a little extra room for their SUV, whether it's at the beach, camping, or a family picnic." SUV owners will find a wide range of uses for the extended space. Since it's introduction, Add-A-Cabana™ users have found that it makes a perfect portable dressing room at the beach or camping, while others use it a great way to open up the back end of their SUV for extended sleeping space, or for a sun shade while preparing a tailgate picnic. Ed Martin developed the concept for Add-A-Cabana™ when he was looking for a way to change from his wetsuit after surfing. "Anyone who has tried to change in the car will appreciate the ability to put this up in just a couple minutes and have room, and complete privacy, to change." 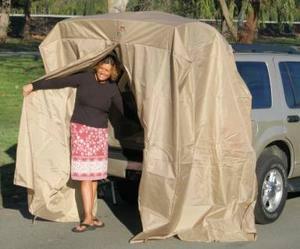 The portable "cabana" attaches to the roof rack of an SUV, and extends full length to the ground. The unit has fabric-covered magnets that hold it to the side of the car, and privacy is provided by the Velcro strips that keep the flap closed as needed. The Add-A-Cabana™ is designed to work on any SUV, except those with a single, side-opened tailgate. The product is currently available in tan or black vinyl. The Add-A-Cabana is currently being marketed direct to consumers through their web site at www.addacabana.com. Add-A-Cabana, Inc. is headquartered in Seal Beach, CA. The company is currently marketing the product direct to consumers at www.addacabana.com. Retailers interested in carrying the product can reach Add-A-Cabana at 888-877-3151.